The aorta is the largest artery in your body and runs from your heart, down through your chest and into the abdomen. It the divides into two blood vessels called the left and right common iliac arteries. An aortic aneurysm occurs when the wall of the aorta progressively weakens and begins to bulge. An aortic aneurysm may continue to enlarge and eventually rupture if left untreated, causing severe internal bleeding and possibly death. Unfortunately most aortic aneurysms are never detected. That is because more than 80% of patients are asymptomatic - that they experience no symptoms at all and don't know they are living with an aortic aneurysm. In fact most aortic aneurysms are discovered inadvertently during procedures to diagnose other conditions such as an abdominal ultrasound or CT scan or a chest x- ray examination. It is important to discover aortic aneurysms because they are a leading cause of death amongst those over the age of 60. Many of these deaths are preventable if the aneurysm can be detected and safely treated prior to the aneurysm rupturing. Aortic aneurysms are more common in those over the age of 60 especially if they have ever smoked cigarettes or have someone in the family who had an aneurysm. The can occur in both men and women but are more common in men. The majority of aneurysms occur as a result of a genetic predisposition to aortic dilatation coupled with various insults such as smoking or high blood pressure. In some people aortic aneurysms can cause symptoms such as pain or a pulsing feeling. The location of this can vary with the location of the aneurysm - upper back, lower back or abdominal pain or discomfort. Screening tests used to detect an aortic aneurysm include a chest x-ray and an abdominal ultrasound scan. Once the aneurysm has been detected a more detailed imaging investigation such as a CT scan with intravenous contrast may be requested depending on the predicted size of the aneurysm and the patients' renal function and any previous reactions to radio-contrast dye. The CT scan is also the best investigation before deciding if treatment is necessary and in designing a stentgraft that will fit the patients' individual aortic anatomy. Figure 1 shows a high quality CT scan of the abdomen and pelvis. 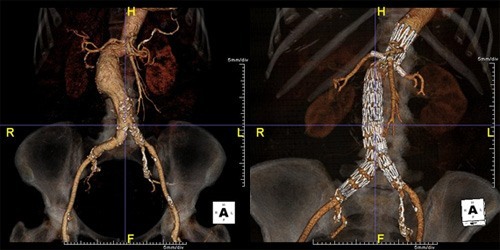 This patient has a juxtarenal aortic aneurysm that is clearly visible on this 3D reconstructed image from a CT workstation. Who should be tested to see if they have an aortic aneurysm? Aortic aneurysms can be safely treated or cured with early diagnosis. 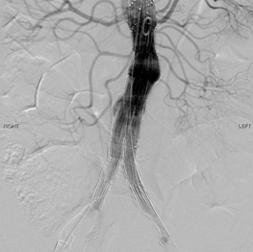 The key is to diagnose the aneurysm before it has ruptured so as to plan an elective minimally invasive repair. 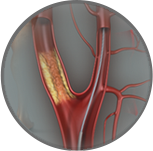 At Specialist Vascular Clinic we have extensive experience with minimally invasive endovascular stentgraft treatment for all types of aortic aneurysms. In screening for this condition we have the opportunity to save thousands of lives. What should I do if I have an aortic aneurysm? Contact Specialist Vascular Clinic. You will be seen by a leading vascular and endovascular surgeon who has undertaken specific subspecialty training in this field and has extensive experience in the modern management of aortic aneurysms. All the treatment options will be discussed with you at length. The optimal management plan will be tailored to your individual condition and only then can you be assured of receiving the care that is most appropriate. What is minimally invasive aortic surgery? Minimally invasive aortic surgery involves using endovascular techniques to place stentgrafts within the aortic lumen to divert blood flow away from the aneurysm sac. There is a reduction in perioperative mortality compared to standard open surgical aneurysm therapies. Most abdominal aortic aneurysms (AAAs) and many thoracic aortic aneurysms (TAA) can now be repaired completely percutaneously using endovascular stentgrafts without the need for any incisions or wounds. This minimally invasive procedure is performed via a needle in each groin and can be safely performed under general, regional or local anaesthesia depending on the patients' preferences and co morbidities. When an aortic aneurysm repair is being planned we use sophisticated spiral CT scan technology together with a 3D workstation to help plan a customised stentgraft that is designed to fit the patients' particular aortic anatomy. This modular type of stentgraft design allows each component of the repair to fit precisely into the aorta as intended in order to seal off the patients aneurysm from pulsatile blood flow. The endovascular stentgrafts are usually introduced from the femoral arteries in the groins. 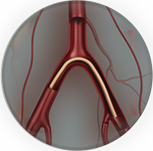 Once accessed via a needle, a guide wire can be placed inside the aorta and the stentgrafts are telescoped over the wire and thus introduced into the patients' aneurysm. 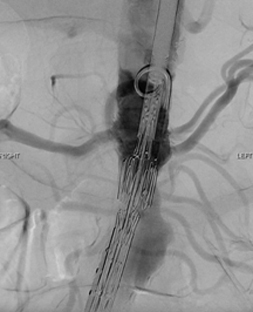 Once in the correct position as confirmed by angiography, the devices are opened in a controlled fashion ensuring precise anatomical deployment. 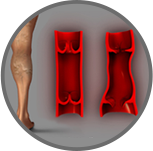 At the conclusion, the previously inserted closure device is used to close the entry site in the femoral arteries which allows the entire procedure to be performed without incisions or wounds. This has significant advantages for the patient who can rapidly resume normal activities following the procedure. This has led to significant reductions in hospital length of stay, time to resume ambulation, time to return to normal pre-admission activities. Figure 2 shows a typical CT scan appearance of an AAA as a bulge or dilatation of the aorta just below the level of the kidneys and just above the level of the aortic bifurcation. The green line is a centreline of flow analysis being performed to help plan the construction of an endograft that will allow an endovascular repair. This line is also the line that the device will follow when introduced from the femoral artery and deployed in the aorta. Figure 3 shows a typical appearance of an AAA at angiography. This is the view of the aneurysm the surgeon works with during the endovascular procedure to repair the aneurysm. 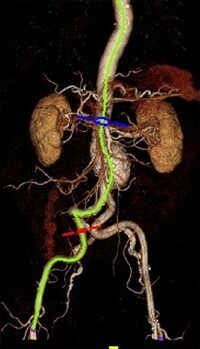 Figure 4 shows the endovascular stentgraft in the correct position and being deployed during the implantation procedure. 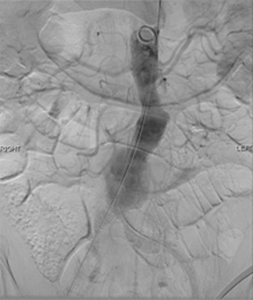 Figure 5 reveals the completed angiographic appearance of a successful endovascular AAA repair with excellent flow in all the renal arteries as well as all the iliac arteries and with no blood flow in the aortic aneurysm. The aneurysm sac has now been excluded from the arterial circulation and is monitored in follow up as it shrinks in size. What if my doctor said my aneurysm was not suitable for a stent? There are no absolute anatomical restrictions on performing an endovascular repair with stentgrafts. Aneurysms in previous years considered not suitable for stenting can now be treated because of advancements in the technology that allow the treatment of the most complex of aneurysms. Today, there are no true contraindications to endovascular repair; instead it is the risk/benefit ratio of each possible treatment option that must be considered for individual patients. Today, there are no true contraindications to endovascular repair; instead it is the risk/benefit ratio of each possible treatment option that must be considered for individual patients. Patients with complex aortic disease have the most to gain from endovascular solutions. Surgeons who desire to implement these new technologies should ideally have subspecialty training in this field and be proficient with image interpretation, manipulation, endovascular grafting of the infrarenal aorta, and renal and mesenteric stenting prior to embarking on complex aortic procedures. Devices will become more complex and will be mated with additional small vessel stent grafts. However, clearly, the benefits of these technologies for this patient population are marked, and physicians must place great emphasis on the support of these technological developments and methods by which these skills can be disseminated. 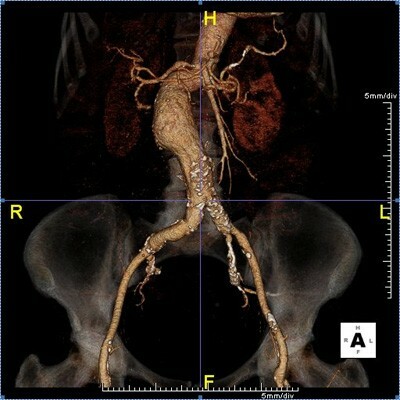 Figure 6 demonstrates an aortic aneurysm that was previously considered not suitable for stents - juxtarenal, angulated neck, severe right renal artery stenosis. At Specialist Vascular Clinic this was successfully treated with a fenestrated stentgraft design incorporating branches for the left and right renal arteries as well as a branch for the Superior Mesenteric Artery (SMA). The scan demonstrates excellent flow through the stentgraft and its branches. There is no further filling of the aneurysm.